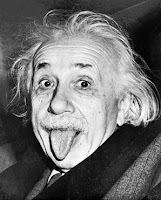 Albert Einstein is best mind known to human. He was the most Intellectual person ever. But still he had a funny side to him. Following are some of his quotes which I found funny. This comment on the tax code is true. I took a tax preparer course this year. It didn't make sense. I hope we get rid of this stupid law and replace it with something everyone can understand. Who is stopping us except us? Thanks for posting these. I really enjoyed reading what another genius (besides myself) has to say. I printed a copy of those sayings and gave them to my boss to read out loud at random. He misread quote number seven. He read, "the universe" instead of ". . the the universe". I guess Einstein was right about human stupidity. What is Albert Einstein's middle name? I thought that last one, about learning interfereing with education was said by Mark Twain, not Albert Einstein...maybe that's what Einstein meant about hiding your sources. I like the last one, I hate school but I am smart. School is stopping me from thinking outside the box! Fix the box, instead thinking out of it. We are carrying out a research when we don't even know what we are doing. True enough, a very good definition to how research is being done. The "Hot stove" quote is a line from the movie "Deep Blue Sea." I don't think Einstein ever said that. unless maybe einstein said it before the movie? I agree that hunam stupidity is infinite because it totally is. middle name is smith or jones. Yea, go Albert Enstein. He only speaks the truth..
Hey don't you love (speaking of school) how during graduation we all wear matching gowns, and matching hats, with matching diplomas, and matching, matching matching, and they speak to us about individuality? REALLY ITS VERY FUNNY QUOTES AND IT IS VERY NICE TO READ .THANKS FOR POSTING THIS. If oh al was still alive he would be my road dog. He is the s***. Einstein is Dead to many,but alive to me.I wasnt around in his era,and he's also not around in my era. *like they asways say. "two kings can't rule the carstle". May katapusan kya ang human stupidity at ang universe.. I enjoyed it lot! These All are best! there is another funny quote by Al that says "if the facts don't fit the theory, change the facts!"